Okay, I admit it. I'm not perfect. Hard to believe, I know. Many of you may have thought so. You may think I lead the perfect life, am happily married, very content with everything I have. But I must admit that there are times I need help. Some direction. Answers to the many questions I have about love, life and whether I should drop off and see Nicky next time I'm in Montreal. Sad for me to have to say all this and I hope I haven't let you down. What's my secret? How have I been able to fool you for so long? Well, if you promise not to tell anyone, I'll let you in on a little ssomething. I am a devotee of Confucianism. Confused? Allow me to illucidate. "Can he do that without drugs?" you may well ask. Well, we're about to find out. At least once a day I zone out. My wife thinks it's when she's talking to me but not true. I meditate. Yep. I sit cross-legged on the floor and am transported to another place for an hour. It'd be about half that time if I was able to untangle my legs sooner. The place I am transported to is an audience with that great Chinese philosopher and "Model Teacher For Ten Thousand Ages", Confucius. NND: Oh wise Confucius thank you once again for allowing me the honour of being in your presence. After all these year Confucius is a little hard of hearing. NND: Confucius, I am so confused by a number of things. For example, my dog is always chasing behind cars. C: Dog who always chase behind cars soon to be exhausted. NND: Good one Mr. C. What do you know about affairs of the heart? C: Man who fight with wife during day get no piece at night. NND: I'll keep that in mind. Do you watch baseball? C: Baseball is silly. Man with four balls cannot walk! NND: Um, okay. Listen, I'm thinking of doing some renovations; adding more windows. Mrs D wants more light in the house. What do you think? C: Man who lives in glass house should change clothes in the basement. NND: On another subject, my friend Ziva is a terrific writer and has a great memory. But her friend Nicky is kind of scattered and can be so forgetful. Why are people so different sometimes? C: Everyone have photographic memory. Maybe Nicky just doesn't have film. NND: Could you explain that popular saying a bird in the hand is worth two in the bush? C: A bird in hand make it hard to blow nose. NND: Okay, I'll remember that. Listen Mr. C, our session is almost up. What piece of advice can you leave me with knowing life has it's up and downs, not unlike an elevator? Gee, I'm starting to talk like you. C: Crowded elevator smell very different to midget. Confucius say link up with Nicky and Mike at We Work For Man Who Eat Photo of Dad Often Spitting Image of Father and check out what else Confucius say. Yes, now my secret is out. I talk to a dead guy. Dufus, I this is so funny. I love how you put all these together in a conversation with the esteemed Confucius. Confucius really is/was a genius. Who can argue with any of those sayings? Oh, yeah those sayings are all on the internet. I just wrote around them. Odd how Confucius gets funnier and funnier as the years pass. Imagine spending time thinking about this. Confucius was a great man even if he had his ups and downs. Who knows if "Confucius says" means "We Work For Cheese"
Watch it PJ. 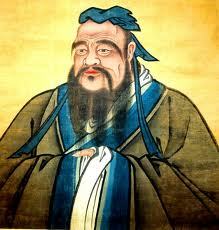 Confucius say man who make fun of facial hair could have close shave. Haha, you are a very funny man, my friend. And I don't care if you get your wisdom from Confucius, to me, you're still perfect. Man who give Confucius run for his money could end up changed man. Thanks, Ziva. Man who give Confucius a run for his money could end up changed man. Thanks, Ziva. "C: Baseball is silly. Man with four balls cannot walk!" I honestly can't picture you sitting cross-legged on the floor for an hour. Or even 10 minutes. But maybe this explains your sense of humor. I found this funny. I must be tired. Few people know that Confucius was such a funny guy. Not only do I sit cross-legged but I levitate. It helps raise my humour to a higher level.